Every year, millions of tourists descend on Turkey. Some are seeking sun, sea, and sand of the coastal beach resorts. Others prefer to indulge in sports pursuits such as scuba diving, paragliding, skiing or trekking. Many, however, are interested in the vast range of historical places to visit in Turkey, and they are rarely disappointed. The colorful timeline of the country spans many centuries. During this time, great civilizations and empires have risen, lived and fallen over the lands. Subtle and prominent traces of their existence still exist in buildings, ruins, artifacts and in some cases, entire cities. Indeed, these unique sites are one of the major reasons to visit Turkey whether you are young or old. We’ve picked the best to help you, plan a journey into the bygone days. By far, the most visited and iconic old site is Ephesus in the Aegean region, near Kusadasi. Historians and archaeologists consider it the greatest ruined city in the western world. 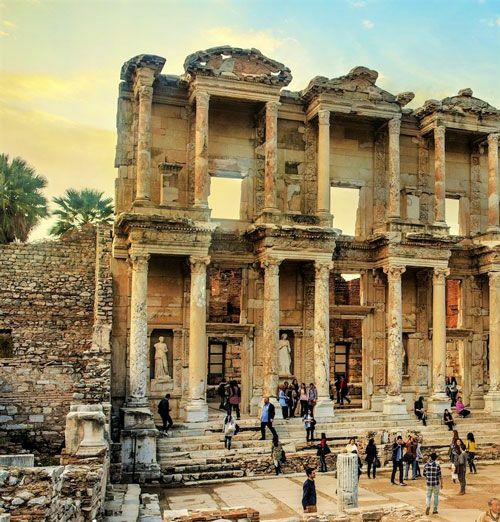 Although its foundation's date from 1000 BC, most of the excavated and restored landmark buildings, date from the Roman period when Ephesus flourished as a highly successful sea trading port. The city is also one of the Seven Churches of Revelation as mentioned in the New Testament in the Bible and key figures such as Saint John, Saint Paul, and the Virgin Mary spent time there. Notable landmarks receiving much admiration include the two-story Celsius Library, Roman terrace houses, public latrines and the large Grand Theatre, scene of the famous Artemis riots in the Bible. 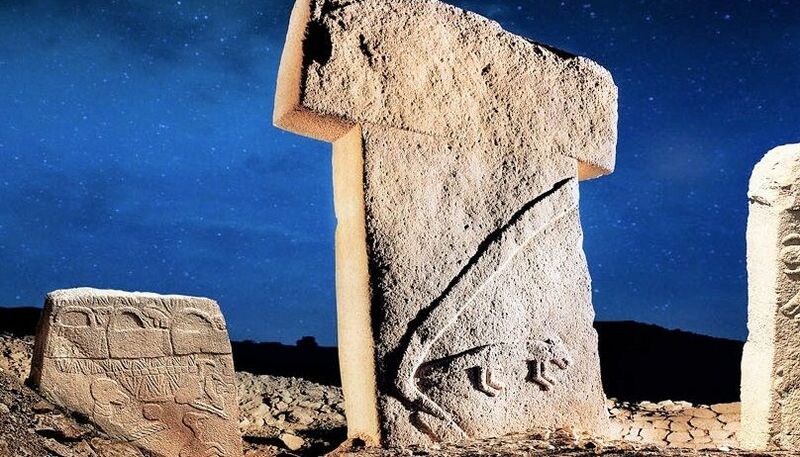 To understand why Gobekli Tepe has the classical world in frenzy, you need to know just two things. The ancient temple is 6000 years older than Stonehenge and 7000 years older than the great pyramids of Egypt. Some publications suggest it was the original Garden of Eden, although historians vehemently refuse this claim. Either way, it is the world’s first religious temple and disputes all arguments that Neolithic man was simply a hunter and nothing more. 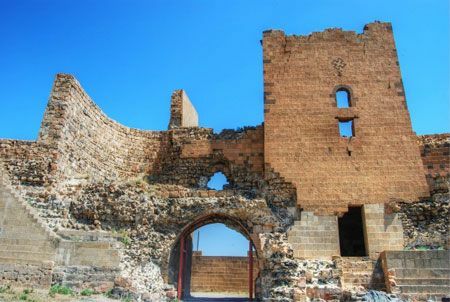 Sitting in the Sanliurfa district of southeast Turkey, now, archaeologists have only uncovered a small section but excavations are ongoing, giving high anticipation as to what will be found in the future. In the heart of central Anatolia, the Cappadocia landscape is a surreal sight to see. Over thousands of years, wind formations have slowly crafted the Tufa Rock into weird shapes such as the fairy chimneys. Mankind also took advantage of the soft Tufa Rock to build cave homes and churches and a small selection of them are open to the public in the Goreme Open Air Museum. Although the man-made caves are impressive in themselves, restored 13th and 14th-century Biblical frescoes adorning the ceiling and walls intrigue historians and Christians alike. While you are in Cappadocia, extend your visit to 3 days and visit ancient sites such as the underground cities and caravansaries that were hotels on the old Silk Road route. 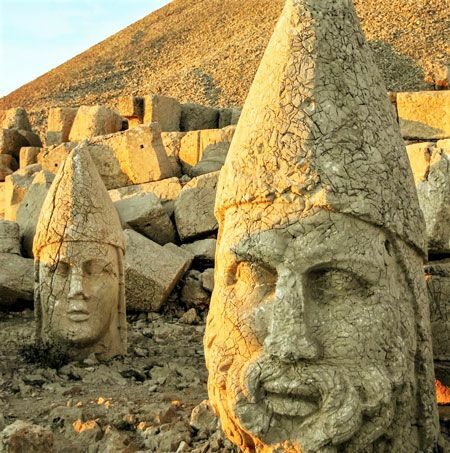 One of the lesser visited but still iconic historical places to visit in Turkey are Mount Nemrut statue heads. Built by King Antiochus between 64 and 38 BC, four small statues of two eagles and two lions surrounded five larger statues of himself and Greek and Persian gods. Time eroded the stone though causing the heads to fall from the bodies. The site is not as well documented or researched as others, yet experts warn the heads are in danger because yearly bouts of cold weather are eroding the stone. It might simply be a case of seeing it while you can. Although Istanbul is the biggest city in Turkey, the small Sultan Ahmet district within is the most important for history lovers. From this neighborhood, Byzantine emperors and Ottoman sultans ruled their lands. You can see all the major landmarks in a rushed one day visit but, we suggest slowly taking in the ambiance and vibes of iconic building son a two or three-night trip. Marvel at the magnificent domed ceiling of the Hagia Sophia, a former church, mosque and now an official museum. Sitting across Sultanahmet square, the 17th-century Blue Mosque is open to visitors outside of prayer times. The sprawling compound of Topkapi Palace, first home to the Ottoman sultans, includes displays of their personal items such as clothing and jewelry, but the harem section is the most talked about. Also, visit the 1001 column Basilica Cistern and take a short detour to the Grand Bazaar, a maze of alleys and shops dating over 500 years. It was the capital city of the Bagratid kings of Armenian, and iconic religious buildings include the Church of Saint Gregory, the Church of the Redeemer and the massively impressive Ani Cathedral with its large conical roof. 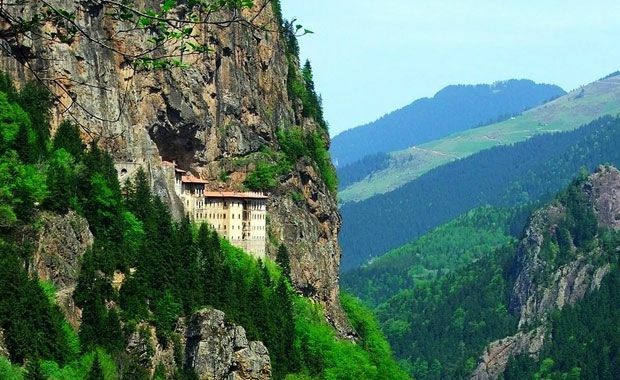 The most surreal place is Sumela Monastery in the northeast Macka national park. This place is a protected haven where flora and fauna thrive. Views of the tumbling green mountains and thick forests covering 4800 hectares enough to excite any nature lover. Its location clinging to the side of a mountain makes it seem like it could tumble down at any minute, yet it has withstood the test of time for hundreds of years after monks first built it there because they found a statue of the Black Madonna in a nearby cave. As well as touring the sleeping quarters and kitchens, a superior room is the church with its magnificent Biblical frescoes adorning the ceilings and walls. 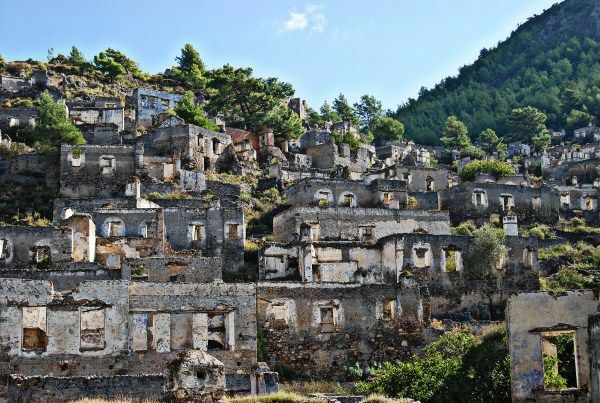 On the Mediterranean coast of Turkey, the eerie Kayakoy ghost village has a fascinating historical timeline portrayed through old houses, deserted cobbled paths and abandoned churches and schools making up the community. Before the Turkish war of independence, it was a flourishing village where Greeks and Turks lived side by side. Unfortunately, the Treaty of Lausanne population exchange was the catalyst for the abandonment of the village. The fiction book by Louis de Bernieres called “Birds without Wings” intimately attempts to tell its story through a love affair between a Greek girl and Turkish boy. In Aegean Turkey, many travel agencies sell a full day trip tour to visit the ancient cities of Miletus, Priene and the pagan worshipping Apollo Temple. Priene city boasts of a magnificent temple of Athena and houses where Alexander the Great once stayed. While the prime landmark in Miletus is the grand theater with its intact back passages and rooms. Lastly, Apollo Temple in Didim was an ancient sacrifice center for citizens of ancient Miletus. Had construction continued when it was in its prime, it would have revealed the Delphi in Greece. Out of all the historical places to visit in Turkey, these three are the quaintest and watching the sunset over the temple is a photographic moment to be remembered.